Pumpkin pie needn't be heavy and dense. This recipe is more like a custard; made without a crust it's simply mixed and refrigerated until firm, about 2 hours. Coat 9-inch deep-dish pie plate with nonstick cooking spray. Place water in medium bowl; sprinkle gelatin over water. Let stand for 5 to 10 minutes or until softened. Bring 1 cup evaporated milk just to a boil in small saucepan. Slowly stir hot evaporated milk into gelatin. 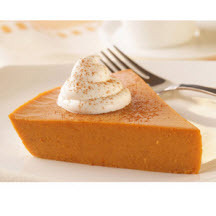 Stir in remaining evaporated milk, pumpkin, sugar, pumpkin pie spice and vanilla extract. Pour mixture into prepared pie plate. Refrigerate for 2 hours or until set.